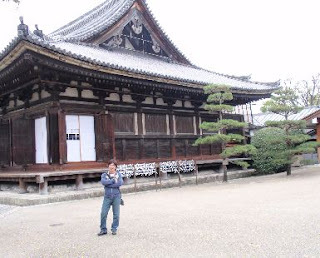 This is Sho-chan at Sanjuusangendou, the famous "Hall of 33 Bays". I always go to Sanjuusangendou when I visit Kyoto, but Sho-chan had never been before. I'd highly recommend it to anyone who enjoys temples even a little. There are more than a thousand spectacular gold-painted statues of Kannon (the Chinese goddess of mercy Kwan-Yin) and they say that anyone can find a statue that resembles someone they know. This is a small pond at Sanjuusangendou. 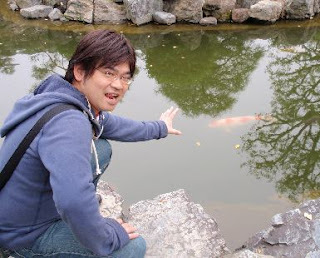 It's a little hard to make out, but there's a large carp swimming in the water near Sho-chan's hand. From Sanjuusangendou we went to Kiyomizu temple, another famous sightseeing spot. On the way there we spotted this couple. 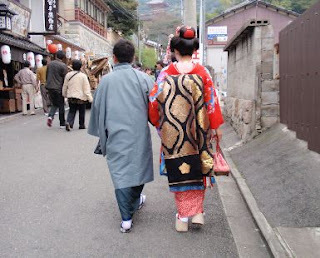 Recently it's become popular for visitors to dress up as a maiko (apprentice geisha) and walk around Kyoto. There are many shops that rent clothes and do geisha/maiko make-up , but you can always tell the real from the fake by the way the walk. The fake maiko have a heck of a time in the giant clogs that go with the kimono. Also real maiko aren't usually strolling around tourist spots in the middle of the afternoon dressed in their full regalia. 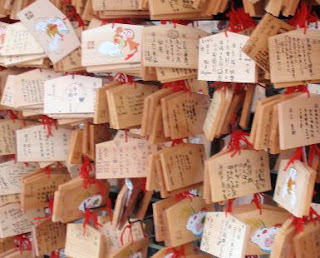 This is a display of ema (votive plaques) at Kiyomizu temple. You can buy one and write your wishes and hopes for the future on it and hang it up here. 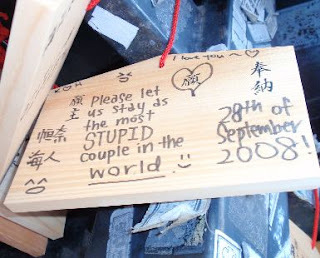 Here is one funny ema that we saw. 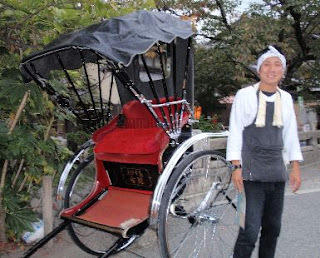 From Kiyomizu we went to Ginkakuji and on the way there we saw many young men pulling rickshaws (rickshaw comes from the Japanese jinrikisha). I've always wanted to ride in one, but they charge an arm and a leg, so we just took a photo. 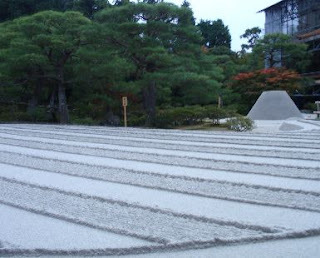 This is the sand garden at Ginkakuji. Magnificent, isn't it? 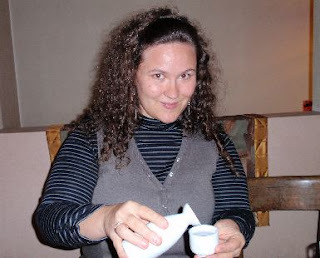 After our long day trekking around we went to a lovely little restaurant in the Gion area of Kyoto. Dad and Julie may remember this place; we had lotus root chips, pumpkin soup and some delicious daikon pickles there. Here I am pouring Sho-chan a little cup of steaming hot sake. 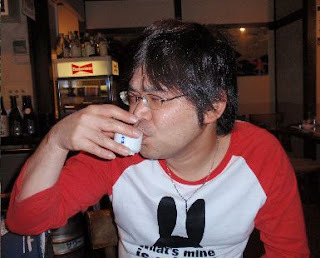 And finally Sho-chan enjoying a well-earned cup of sake at the end of a long day of walking. 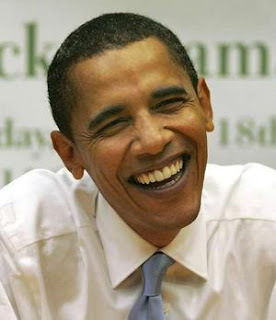 Until next time, see you!